Today marks the opening of the Consumer Electronics Show (CES), which means a glut of tech news and products are on the way. Garmin is making headlines almost immediately with their new Varia Vision for cyclists. Like Google Glass, Varia will overlay a digital interface over the real world; that means cyclists will get updates on cars in their vicinity, real-time step-by-step directions, and apps displayed in the corner of their vision. Varia Vision will clip onto any pair of sunglasses and project onto the lens. It can be set to display road data, personal fitness data, and notify users when they have a call or text. The interface is controlled via a swipe touchscreen on the side of the display, letting users easily cycle through display options. The device weighs one ounce, will last up to eight hours, and retails for $400. Those are great stats for bikers, who want to minimize their weight and maximize cycling time. Hopefully we’ll get some real-use reviews soon, which will tell us if the tech really makes cyclists safer, or if it just provides another level of distraction. 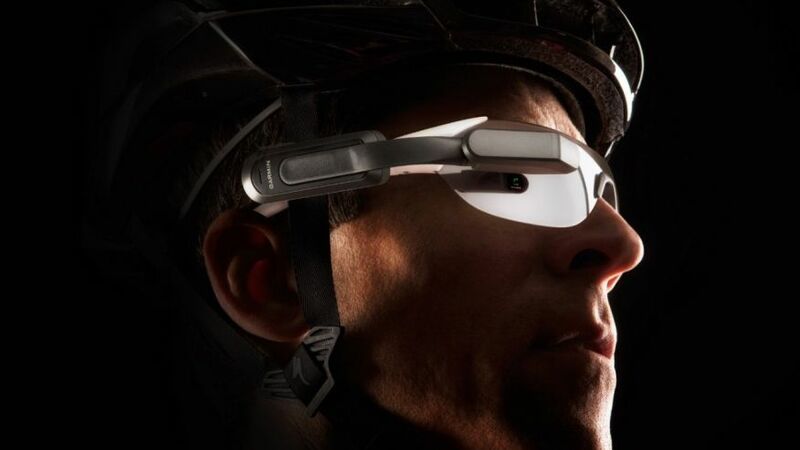 Garmin may be starting a trend for fitness interface; hopefully we’ll have a slew of safer cyborg bikers in the future. If the technology works well, we can probably expect similar devices for runners, motorcyclists, and possibly even drivers (a dashboard display could outpace the GPS screens in most modern cars). Keep coming back for the most up-to-date and vital reviews from CES. The show will go on until the 9th, but we’ll be covering its innovations for much longer than that.